Every year since 2008, IdeaWorksCompany searches for disclosures of financial results which qualify as ancillary revenue for airlines all over the globe. Annual reports, investor presentations, financial press releases, and quotes attributed to senior executives all qualify as sources in the data collection process. Of the 135 airlines reviewed, 67 were found to reveal financial results related to ancillary revenue. From this list, total airline revenue and ridership data were collected to determine the top ten airlines in overall ancillary revenue, as a percentage of company revenue, and on a per passenger basis. The 7th annual Switchfly Reward Seat Availability Survey also finds JetBlue has best reward payback among major North American carriers. Value-oriented airlines dominate the top tiers of the 7th annual Switchfly Reward Seat Availability Survey. Two global carriers made significant improvements to their rankings. Turkish Airlines had the 4th best reward seat availability for 2016, which is much improved from its 15th place ranking in 2015. Likewise, Air China showed big improvement by moving to the 10th slot from 18th place in 2015. The need for ancillary revenue requires airlines to venture beyond the booking confirmation email. This report follows that path to learn how airlines gain more sales after a booking is made. IdeaWorksCompany assessed the full set of emails sent by six top ancillary revenue airlines to learn how they encourage customers to buy more. Examples from Aer Lingus, AirAsia, easyJet, Ryanair, Spirit, and Vueling provide a global display of these retail skills. Website examples from all over the world illustrate best practices on fare displays, baggage pre-pay, seat upgrades, and other top a la carte items. The latest report from IdeaWorksCompany reviewed the websites of airlines all over the world and details good practices regarding booking paths ─ and also what airlines should avoid. IdeaWorksCompany, the foremost consultancy on airline ancillary revenues, and CarTrawler, the leading provider of online car rental distribution systems, project airline ancillary revenue will reach $59.2 billion worldwide in 2015. The CarTrawler Worldwide Estimate of Ancillary Revenue represents a giant increase of 163% from the 2010 figure of $22.6 billion, which was the first year for the ancillary revenue estimate. The basic fare with a la carte extras has given way to bundling, branded fares,and the promise of personalized pricing. Visit the websites of leading airline retailers today and you will see a robust display of various pricing methods. Consumers encounter branded fares, service bundles, subscription plans with prices that are fixed, flexible, or dynamic. Someday they will also encounter pricing which is aimed at them as individual consumers. The latest report issued by IdeaWorksCompany is designed to prepare industry professionals for the decision-making required to take merchandising to the next level with examples from the world of airline retail. Marriott Rewards returns an average of 9.4% from room night spending as reward stay value in the first Switchfly Hotel Reward Payback Survey. 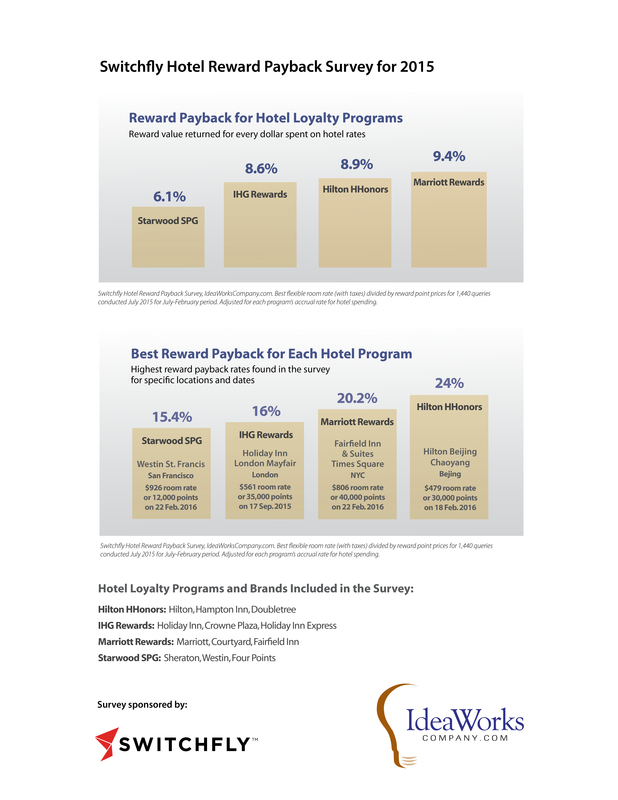 That’s a 54% higher return than the reward value provided by Starwood SPG, which was ranked last among the four hotel loyalty programs at 6.1% for reward payback. During July 2015, IdeaWorksCompany conducted 1,440 reward queries for key hotel brands in four global frequent guest programs: Hilton HHonors, IHG Rewards, Marriott Rewards, and Starwood SPG. The result provides an average “reward payback” for each program, which is described in this press release. For the eighth consecutive year, 63 airlines tracked by IdeaWorksCompany reported substantial increases in revenue from retail activities and the sale of a la carte services and frequent flier miles. The IdeaWorksCompany study, sponsored by CarTrawler, focused on 63 airlines which disclosed qualifying revenue activity, to reveal that ancillary revenue reported by these airlines was $38.1 billion for 2014. The most recent ancillary revenue report sponsored by CarTrawler celebrates retail and merchandising innovations that support ancillary revenue. It offers a collection of examples that rely upon technology and training to create a type of mercantile seduction that encourages consumers to open their wallets and spend. Vendors were invited to share details of client success stories. These were included with other examples, such as JetBlue and Tuifly.com, to create a report filled with services and products that stimulate the imagination and a carrier’s income. The examples in this report demonstrate the revenue power harnessed when companies engage their customers with attractive storefronts, be they in the city center, online, or up in the air.